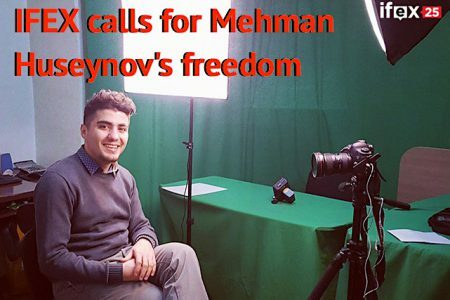 IFEX, the global network of 119 organisations dedicated to promoting and defending the right to freedom of expression and information, strongly condemns the decision by the Supreme Court of Azerbaijan to return the case of Mehman Huseynov, chair of IFEX member the Institute for Reporters Freedom and Safety, to the appellate court that had previously convicted him.Huseynov is well-known for his critical journalism investigating alleged corruption by Azerbaijani officials. He was given a two year prison sentence in March 2017 on charges of defaming a police station, after publicly giving a statement describing his assault and abuse with electrical shocks within the station. On 29 September, the Supreme Court of Azerbaijan returned Huseynov’s case to the Baku Court of Appeal, on the grounds that additional evidence needed to be taken into account in their judgment. The court’s decision to validate rather than dismiss the punitive defamation case against Huseynov, lodged by those who abused him, fails to right a clear injustice. No one should be jailed for speaking out about how they’ve been physically abused by the agents of their government. It also contrasts sharply with the perfunctory dismissal of Huseynov’s own judicial complaint about his treatment. The Supreme Court’s decision will further prolong his detention on these questionable charges, the underlying effect of which is not only punishing Huseynov, but also strongly chilling potential dissent and public protest by other Azerbaijani citizens. While the government in Azerbaijan seems committed to continued punitive use of Azerbaijan’s judiciary, we are encouraged to see that international actors have begun to register their disapproval for this activity more strongly. We note for example the Council of Europe’s Committee of Ministers recent landmark opening of a legal infringement proceeding against Azerbaijan, prompted by its continued indifference to a 2014 verdict by the European Court for Human Rights that its detainment of political activist Illgar Mammadov is illegal. Huseynov’s arrest was widely condemned by European institutions such as the OSCE and European Union’s External Action Service; more is now needed. Call on UNESCO’s Director General to withdraw the honorary UNESCO ambassadorship of Mehriban Aliyeva, wife of president Illham Aliyev and recently appointed vice-president, or make it’s continued validity conditional on Mehman’s release and an end to politically motivated court cases.